The last few months have featured an endless stream of Ubisoft trailers being pumped into our eyes. The one benefit of this is I can now recognise, purely from the title, whether any individual trailer is worth your time. For instance, this: the "101 trailer" for The Crew. It's an exhaustive eight minute look at the open world racer, explaining just about everything there is to know about the game. If you have even a passing interest in gunning it through a miniature US continent, it's probably worth a look. 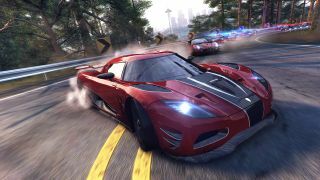 The Crew is due out on 2 December.